Remember the Radiohead Concert That Wasn’t a Disaster? Radiohead is returning to D.C. on June 3 with a concert at the Verizon Center. If you're a member of the band's online store, W.A.S.T.E., you can buy tickets there on March 8. If you're not, then tickets go on sale Saturday -- and if you'd like to get up close with general admission floor tickets, be prepared to get up early. As DCist reminded us Monday morning, torrential rains prevented many fans from reaching the band's show at Nissan Pavilion in 2008. 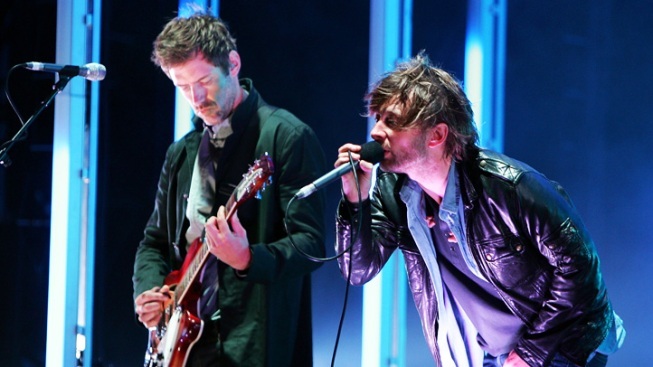 The Washington Post's Going Out Gurus blog tacks on several other Radiohead outings in D.C. that were beset by disaster: The five-piece's two-night stand at Bull Run Park was canceled and never rescheduled when a downpour basically turned the venue into the La Brea Tar Pits. And in 1998, on the first day of the Tibetan Freedom Concert at RFK, a showgoer was struck by lightning; she survived, but the remainder of the day's schedule did not. Also, per WCPcontributor and DCist Associate Editor Benjamin R. Freed, there was the time Radiohead distributed a free newspaper around the globe but sent fans in D.C. to the wrong address. I'll admit that adds up to a remarkable amount of bad luck for Radiohead fans in the D.C. area. But what about the band's August 2003 performance at Merriweather Post Pavilion? As far as I recall, that one went off without a hitch. The setlist was varied. The group was in good spirits. The lighting setup kind of looked like "The Matrix". At Wednesday's exceptional two-hour show, however, Yorke and Co. restored their followers' faith with a set that rocked and crescendoed like the good old days -- and left most of those head-scratching bleeps and blurps back in the studio where they belong. Even the silly set design was meant to delight; a gaudy display of colors, strobe lights and rolling fog, the stage looked like a Vegas casino one minute, and the finale of "Close Encounters" the next. So, confidential to Radiohead: Be like 2003. I'm tired of making "High and Dry" jokes. Remember the Radiohead Concert That Wasn’t a Disaster? was originally published by Washington City Paper on March 5, 2012.